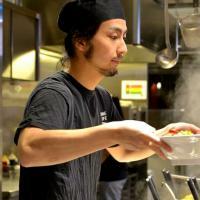 As a long string of islands, Japan is home to many different types of ramen, with each region having its own artfully crafted speciality based on its unique culture and locally abundant produce. There are literally hundreds of styles of ramen to try in Tokyo, as it’s home to the largest variety of regional specialities. You may have heard of shio (salt), shoyu (soy sauce), miso (fermented bean paste), and tonkotsu (pork) based ramen, but there are countless varieties of noodles, toppings, seasonings and classifications of heaviness to try too! 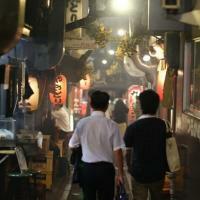 So join a ramen addicted Host and feast your way around the Okachimachi or Ikebukuro neighbourhood together. You’ll try three completely unique and distinct types of ramen, as well as learning about the fascinating, dizzying world of ramen with your Host - it’s much more complicated and diverse than you could ever have imagined! You’ll feast your way around a neighbourhood which is renowned amongst locals for its multitude of ramen shops, an area slightly off the beaten path where you’ll certainly need a Japanese speaking local to show you the ropes. You could visit Okachimachi, a neighbourhood just a few stops from Tokyo station which is home to a large market, plenty of standing bars and ramen joints and an easygoing atmosphere. Or maybe you’d prefer to eat your way around the ramen shops of Ikebukuro, a business district that’s known as the entrance to suburbia; for these reasons it’s popular meeting point for people travelling in and out of central Tokyo, meaning hundreds of ramen shops to choose from! Let us know your tastes and preferences, and your Host will choose three ramen shops to visit, where you’ll slurp three completely unique bowls of ramen, giving you a taste of just how wildly diverse Japanese ramen can be. Maybe you’d like to try yuzu ramen, a unique speciality you’ll rarely find outside of Japan. Yuzu is a type of Japanese citrus fruit, which gives the broth an unusual flavour and keeps it light and tangy - broth is classified as assari, which means ‘light’. 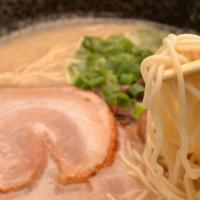 Try a classic Tonkotsu ramen, the speciality of Fukuoka, a city in Kyushu which is Japan’s largest southerly island. The best Tonkotsu ramen shops simmer their broth for hours on end, and some even claim to cook it for a whole day! The broth is a milky white, opaque colour which is just so silky and creamy, and is classified as kotteri, which means ‘heavy’. 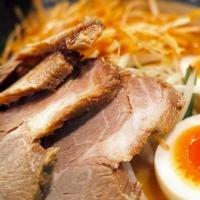 If you’re a ramen addict yourself, you’ll want to discover new styles and flavours. Have you ever tried Tsukemen ramen? With this style, you’re served one chilled bowl of noodles, and one steaming bowl of broth. Dip the noodles in the broth bit by bit to let them soak up the flavour, then enjoy! As you slurp your way through three bowls of ramen, you’ll learn about the different classifications, toppings, ways of cooking and ways of eating. Your Host will also show you how to order from ramen vending machines, and etiquette for how to eat it.